Left, the cap nut for adjusting the Poly V blt from the front. 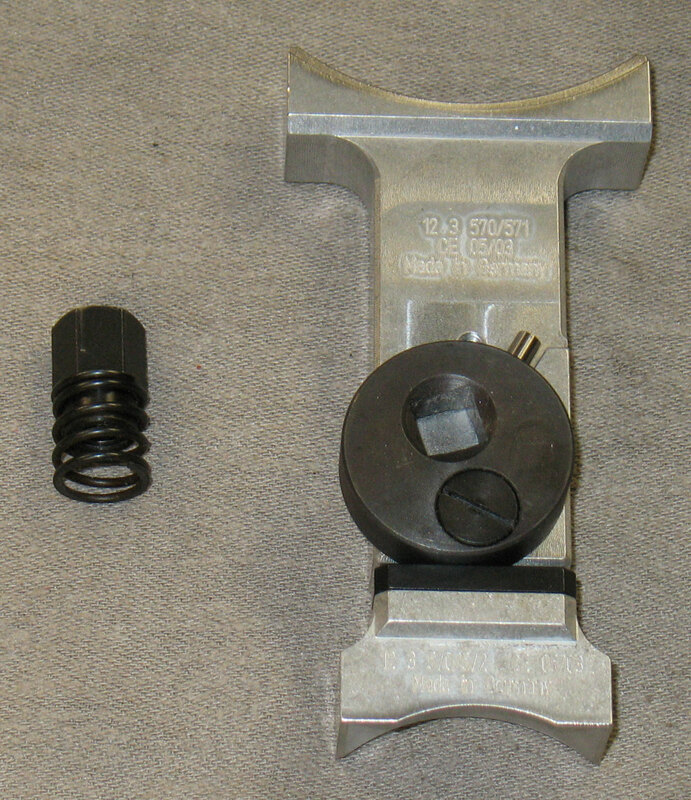 Right: the collapsible tool for setting the ELAST pulley spacing. This is a brief history of the alternator belts used on Oilhead boxers and the differences in how they are maintained. These models (R1100RS through the present) are the only ones with such belts; K and F series bikes have direct-drive alternators without belts. For reference, the Oilheads (R1100, R1150, R1200C) came with 40A or 50A alternators, and the Hexheads (R1200GS and later) come with 40A or 55A alternators. Whereas adjusting similar belts on cars might come down to feel, the important point here is that there are absolute specifications for tensioning these belts. There is no need to use any kind of personal judgement on how tight or loose the belt should be. Poly V belt, a traditional cord-reinforced rubber belt used only on Oilheads (1993 through 2003 50A alternators, and all 40A alternators*). On early bikes the replacement interval was 24,000 miles; later it was increased to 36,000. Starting with the R1150 models, a re-tensioning after 6000 miles was added to the service schedule. This means the belt is re-tensioned at 6000 miles, replaced at 36,000, re-tensioned at 42,000, etc. This requirement was not retroactive to the earlier bikes. ELAST, a stretchy belt introduced in July 2003 (2004 models). This was used with '04 and later 50A alternators and all Hexhead alternators. True to its name, this is an elastic belt, which is stretched to a predetermined length. The elasticity provides the tension. On the 50A and 55A models using this belt, a freewheeling pulley on the alternator reduces the belt load. ** By 'freewheeling' I mean that it works just like a bicycle; the pulley will turn the alternator in the normal direction, but if the pulley slows down, as it does in the course of normal engine vibration, the alternator will continue to spin if conditions permit. This eliminates all of the 'backward' loading on the belt. Since the distance between the pulleys doesn't change, there is no need to re-tension this belt during its life. 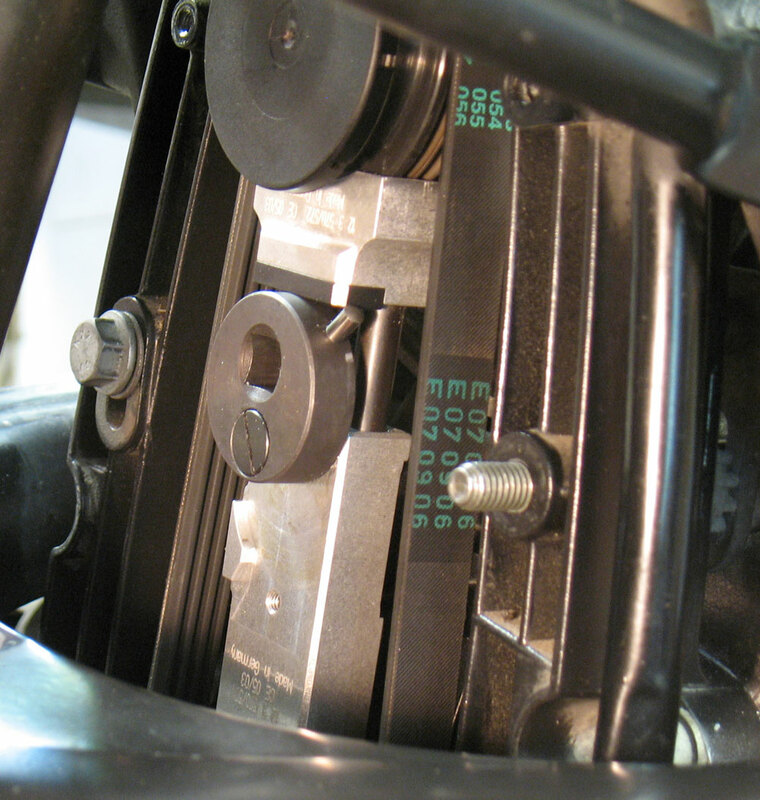 The Poly V belt is tensioned using a toothed adjuster which is part of the lower left mounting bolt. 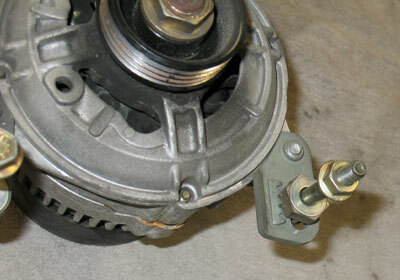 All three fasteners are loosened, then the adjusting bolt is turned to lift the alternator. When there is 8 Nm torque on the bolt, the three fasteners are tightened. 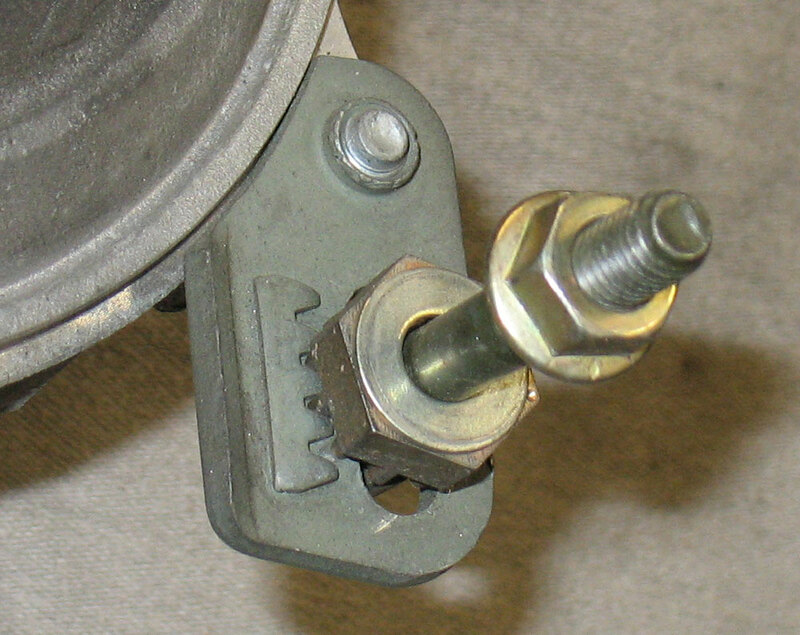 Front view of lower left mounting bolt. The larger six-sided part looks like a nut but it's keyed to the bolt, and turns with it. Teeth on the back side of that part lift the alternator as the bolt is turned. 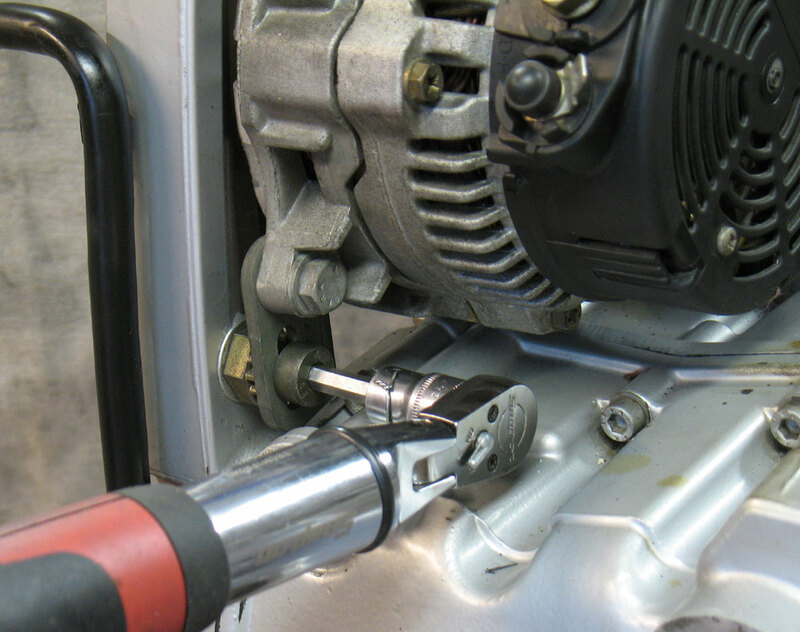 When the R1150RS was introduced, changes to the wiring harness made it difficult to access the head of the adjuster bolt, so a tool was created to torque this bolt from the threaded end (in front). This relatively inexpensive tool is little more than a nut with a closed end and a spring; it threads over the end of the bolt until it bottoms out, then can be used to turn the bolt. It can be used on all bikes with Poly V belts. On older models the Poly V belt can be tensioned from the rear with a 6mm allen. 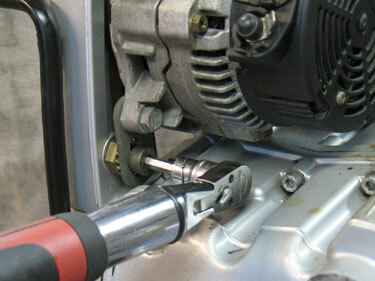 BMW tool 12 3 551 being used to turn the same bolt from the front. Much easier! On some bikes, the powdercoat finish on the alternator mounting bracket softens and flows around some of the mounting bolts. This can block the motion of the alternator and alter the torque reading. I scrape the ridges of excess powdercoat away with a razor blade. The ELAST belt is not tightened to a particular adjuster torque or belt tension, but rather it is set to a fixed length. This confuses many people with late Oilheads for two reasons: BMW never updated the repair manual that was sold to owners, and the old adjuster mechanism is still present on the bikes although it is no longer used. The change to the service procedure was only published in a Service Bulletin which went to the dealerships. The old adjuster parts are still there on the 1150 because they hold that corner of the alternator to the bike. 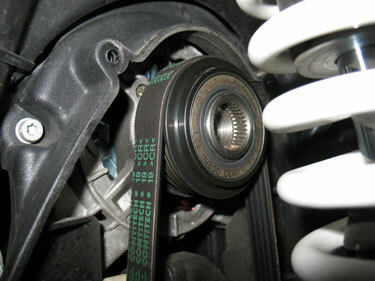 Consequently, the alternator is still free to slide up and down, and this is how the new belt is installed. But when it comes time to tighten the belt, the two pulleys are pushed apart to a preset distance using a special tool, then the alternator is bolted down tight. At no point is there any assessment of tension. Although the tool shown in the picture is handy, any method of spacing the pulleys properly (116mm between pulley flanges) will accomplish the goal. 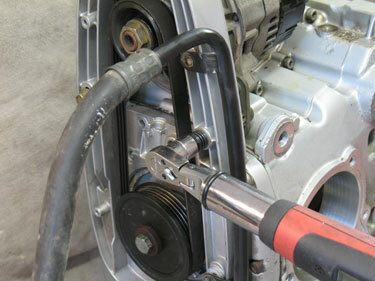 ELAST belt and pulley on an R1200RT Tool 12 3 570 being used to lift the alternator to the correct height on an R1150RT. 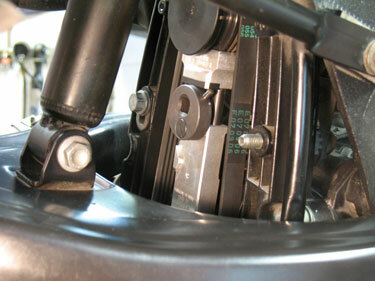 On the R1200 models, the alternator is simply bolted to the bike without any provision for adjustability. The belt is 'walked' on and off as the engine is rotated. To facilitate this, the lower (drive) pulley does not have a flange on the front edge as the earlier ones do. You'll see this passed around from time to time. The idea is that by twisting the belt with your fingers, you'll know the tension is correct because it gets harder to twist after 90° of twist. This is simply bad advice to give or follow, for someone who is using that as their only gauge, as the belt will exhibit those characteristics throughout a wide tension range (try it with an inexperienced person at 4 Nm and 12 Nm if you want to see for yourself). The amount of 'easy twist' at a given belt tension will vary with the free length of belt, belt construction, belt width and other factors which are somehow deemed irrelevant when this rule is passed around. * Non-ABS bikes were usually equipped with 40A alternators rather than the 50A ones. ** One exception is the R1200ST, with a 55A alternator but lacking the frewheeling pulley.